Let’s Rock the Wedding Season with More Slaying Looks and Attire!! Attention Ladies and Gentleman, let’s rock the wedding season with more slaying looks and attire. 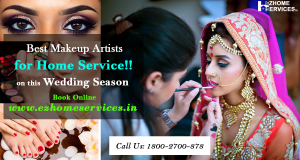 As icing on cake, Ezhome services is providing an on demand beauty and salon services which for all the peoples living in different cities of India. Ezhome services cover the entire gamut of beauty therapies that can be delivered within time and safely of your home. The service delivered by our trained and experienced therapists, using reputed brands, quality checked hygienic products. We have huge list for beauty treatments which includes routine full body waxing, threading, bleach, clean-up, facial, pedicure, manicure, cut or spa one hand or more advanced ones like hair straightening smoothing or hair style and makeup at the higher end. Along with women, men are also need to groom themselves as much as they can, avoiding the crowd at the salon, you can call expert groomer or hair dresser within desired time slot. Since the wedding season is considered as most busiest season for such shopping and grooming things. There are lots of thing related to looks when you need urgent attendant at your venue at a time and crowd perspective you annoyed to join beauty salons. So regarding this, we bring to having professional experts, directly to your door step at single knock. The wedding season despite being seasonal is a thriving one and has a high growth requirements of the season, the backstage experts inspired some of the most prominent beauty trends and this season Wedding is an externally important event in the life of every women. On this special day, women leaves no stone unturned to look beautiful. However, it is desired that you pay some extra attention to ensure that you avail some of those indispensable beauty treatments so that you look flawlessly beautiful. There are so many beauty salons that offer you pre-bridal beauty packages. Ezhomeservices have bridal beauty packages that cater to every service that a bride would require. We ensure that the services and packages we introduce which cover the basics of hair make-up, nails and most of the beauty treatments. We even customize our services to a bride’s needs. Hair Care– A bride’s beauty lies in her ravishing hairs and their freshness, enjoy hair spas and stylish haircuts to get the soft silky mane for the most important day of your life. Body Massage– Get stress free time to time with the most expert fingers on your pressure points. Manicure and pedicure- A lot of ceremonies involve exhibiting your feet and hands never neglect them let them keep fresh and attractive. Facials- Getting a spotters radiant face is most vital for this important day. Wide range of facial like gold, diamond or pearl facials are the best to go ahead with. Hair Spa- Hair spa would help you get soft and silky hair. We guarantee a neat clean and hygienic home salon experience, by our trained female and male therapists. We earnestly look forward to pamper you soon in the comfort zone including your safety. We are currently offering our services in 18 cities – Allahabad, Amritsar, Bhopal, Chandigarh city, Delhi-NCR, Indore, Jaipur, Kota, Kanpur, Lucknow, Ludhiana, Mumbai, Nagpur, Nasik, Pune, Surat, Udaipur, and Varanasi. So do not much hesitate when urgent services required. Do ping over our toll-free no. 1800-2700-878 or visit us at ezhomeservices.in.